When you stay on the Tuscany Umbria border you have the option to visit both these Italian regions, here’s a brief guide to some the larger towns in Umbria,. Perugia is the capital of Umbria, it is easy to miss out on thanks to the large amount of urban sprawl below the old city and a one way system that seems designed to confuse the visitor. Negotiating the one way system is easier these days thanks to the widespread use of GPS (I always go to the Partigiani car park). in addition, you can directly access the beautiful centro storico using the Mini Metro transport system (use the large car park near the Madonna Alta exit on the Super Strada). Collegio di Cambio – beautiful frescoes by Perugino. Galleria Nazionale del’Umbria – art works by Perugino, Piero della Francesca, Fra’Angelico. Piazza IV novembre – stunning piazza with medieval fountain at the centre of the city. Fontana Maggiore – the fountain at the centre of Piazza IV movembre. Etruscan Well – enormous well constructed by the Etruscans. Underground City – medieval streets that became the storerooms for the pope’s fortress. Arco Etrusco – huge entrance to the city built by the Etruscans. Via Maesta Delle Volte – impressive arches over this alley support the buildings. San Severo – a half finished fresco by Raphael. Sala del Collegio di Mercanzia – wood panelled meeting room for the merchants’ guild. Sala dei Notari – frescoed meeting room open to the public if not in use. Oratorio di San Bernardino – impressive carved facade on this church. Via Acquedotto – medieval aqueduct that is now a pedestrian walkway. San Pietro – a short walk away from the centre, visit the frescoed interior. Museo Archeologico – lots of Roman and Etruscan artifacts. Hypogea di Volumni – Etruscan tomb on the outskirts of the city. The home town of Umbra’s most famous saint, St. Francis, this town has millions of visitors every year so if you don’t like crowds, go early in the morning or in the winter. The town’s buildings have a pinkish hue because of the color of the stone from Monte Subasio, the mountain behind Assisi. Almost everyone is surprised to learn that the town’s patron saint is not St. Francis but San Rufino, an early Christian bishop and martyr. The Romanesque Duomo, rather than the Basilica of St. Francis, is the church built in his (San Rufino’s) honour. 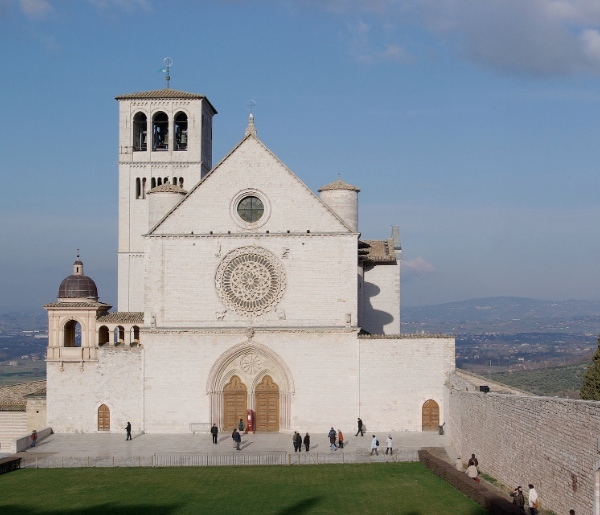 Basilica of St. Francis – huge church & the world’s greatest collection of medieval painting. Duomo (San Rufino) – Romanesque facade and inside the font used to baptise St. Francis. Basilica di Santa Chiara – huge flying buttresses support this impressive church. The Rocca Maggiore – vertiginous views from the tower. Tempio di Minerva – Roman temple converted to a church. Roman Forum – under the Piazza del Comune, a collection of Roman remains. San Damiano – small church outside the town walls where St. Francis had a vision. Santa Maria degli Angeli – huge church below Assisi built over St. Francis’ original chapel. Eremo Dei Carceri – monastery in the woods 6km from Assisi. A medieval masterpiece of a town built on the lower slopes of Monte Ingino. 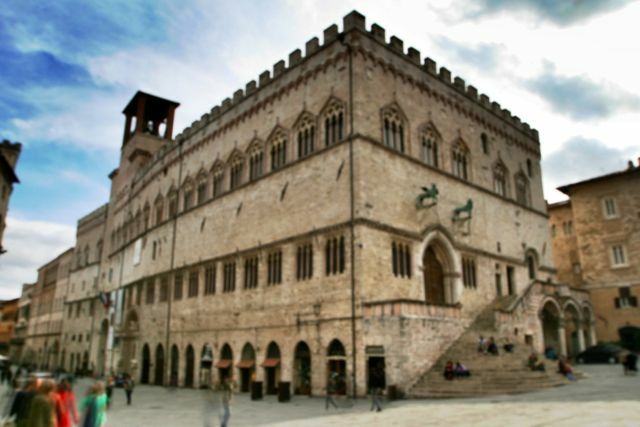 If relatively small towns like Gubbio could build enormous civic buildings like the Palazzo dei Consoli, medieval Italy must have been a very wealthy place. 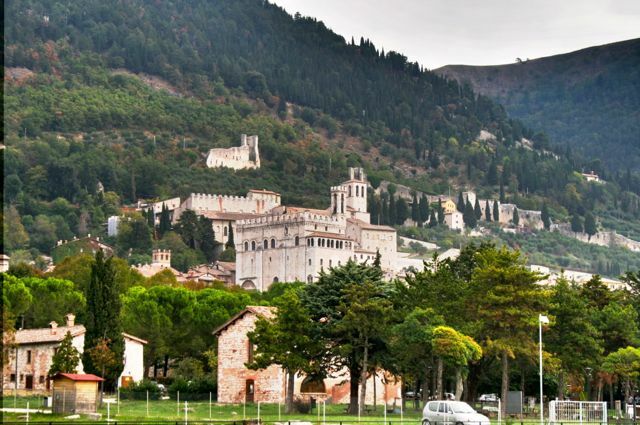 Gubbio is relatively isolated and this means it is not overrun with visitors – another point in its favour. In recent years a lift (or elevator if you speak American) has been installed in the town making it easy to negotiate the steep streets. The first lift connects the lower part of Gubbio with the Palazzo dei Consoli and a second (not so easy to find) lift goes up to the Duomo. Palazzo dei Consoli – huge medieval town hall on the Piazza Grande, worth a look inside. Piazza Grande – large piazza built on enormous supporting arches. Duomo – impressive interior with unusual supporting arches. Funavia – cable car ride up Monte Ingino. Basilica di Sant’Ubaldo – see the blackened corpse of Gubbio’s patron saint in a glass coffin. St Agostino – frescoes of the life of St. Agostino, also gruesome scenes of torture by demons. Rocca – views from the very top of Monte Ingino (walk from St. Ubaldo). Ducal Palace – Federigo di Montefeltro’s residence, now used for art exhibitions. Roman Amphitheatre – below the town near the main car park. A medieval town with Roman origins perched above a wide gorge, Spoleto rose to prominence as the capital of a Lombard ruled duchy after the fall of the Roman Empire. 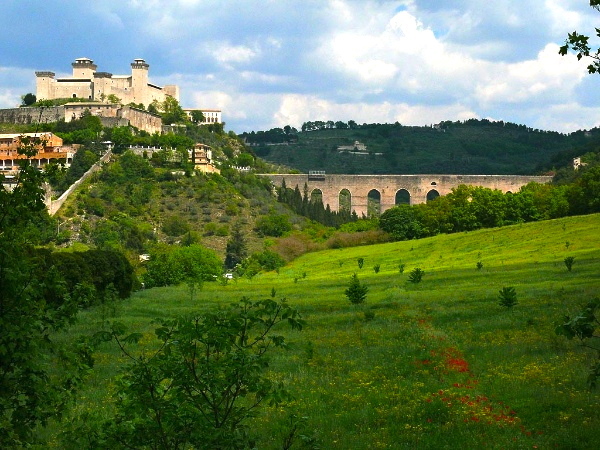 The Duchy of Spoleto lasted from AD576 to 1155 when Frederick Barbarossa captured the town. Ponti delle Torri – enormous medieval aqueduct, 76m at its highest point. Arco di Druso – this Roman arch at the entrance to the forum (now the market). San Pietro – Romanesque facade and views of Spoleto from across the gorge. Roman Theatre – the remains of the town’s amphitheatre. Rocca – even if you don’t go in you can’t avoid seeing this impressive fortress. Sant’Eufemia – Romanesque facade & unusual interior. San Salvatore – early Christian church incorporating part of a Roman temple. Museo Diocesano – the highlight is a Madonna & Child by Filippino Lippi. Museo Archeologico – a collection of Roman & Etruscan remains. Perched high on a volcanic plug in southern Umbria, Orvieto has one of Italy’s finest cathedrals with some apocalyptic frescoes inside. Originally Etruscan in origin and built mainly from tufa, a soft volcanic rock, the town has a distinct appearance from other Umbrian towns. Duomo – built from striped marble, it has a fine facade and spacious interior. San Brizio Chapel – inside the Duomo, apocalyptic frescoes by Luca Signorelli. 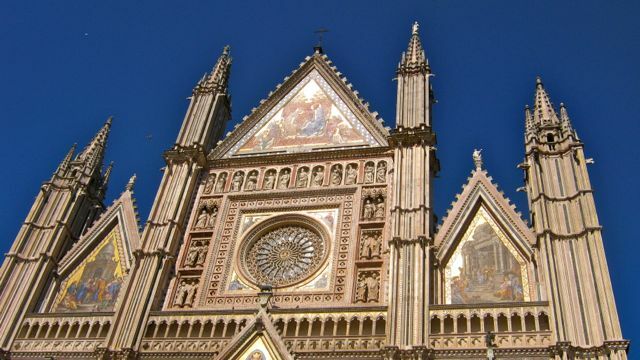 Torre del Moro – climb to the top for a bird’s eye view of Orvieto. Pozzo di San Patrizio – deep well with a double spiral staircase. Orvieto Underground – tour the spaces carved out below the town. Crocifisso del Tufo Etruscan Necropolis – Etruscan tombs outside Orvieto. Museo Archeologico Nazionale – Etruscan & Roman stuff. Museo Emilio Greco – ceramics collection.